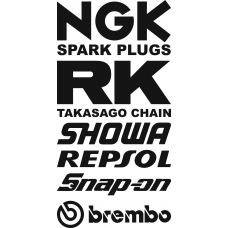 Fairing sponsor sticker set, the content of this set is most suited to Honda motorcycles, although they can be applied to any bike, or toolbox for that matter! Set includes TWO of each sponsor shown, each measuring 100mm across. Please choose your colour option from the drop down list. Fairing sponsor sticker set, the content of this set is most suited to BMW motorcycles, al..